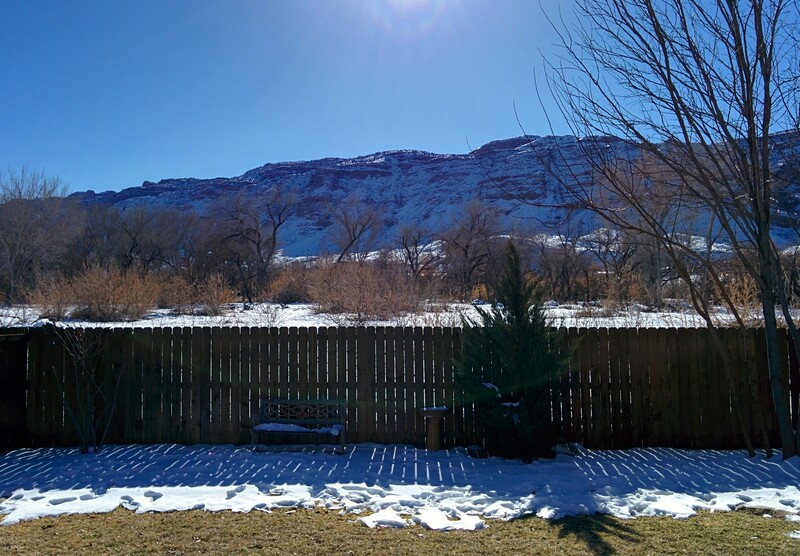 Finally, after many delays, here’s the third and final part of my Utah trip back in December 2013. If you don’t know what I am talking about, here you go! Part three covers days four and five of the trip. Our skiing lesson was scheduled from one till four and we were expected to arrive by noon to be in a position to start on time. Since the drive to Park City was expected to take four hours, we had planned to leave by seven. But by the time we were on highway 191, it was already 7:20. Park City is just a half an hour’s drive away from Salt Lake City, in the mountains. It hosted the 2002 Winter Olympics. The morning drive allowed us to see some great sights. Visible to our far right were the red borders of Arches. The road ahead was a clear, dark-grey line through a field of white snow patches. The accumulated snow had melted considerably since we came down this road a couple of days ago. At one point, the road curved and we were headed directly towards a ‘wall’ of rock plateaus (weird description, I know; the picture should help). It was freezing cold that morning. The desert sunlight was making it hard for us to believe that the temperature was minus fifteen degrees outside on this clear, sunny day. Throughout the northward drive, we could see mountains on the right; the countless wrinkles on their sides adding to the beauty. There had been no time for breakfast that morning. By the time we neared the city of Provo, we started looking for places to eat nearby. Since we were still on the highway, we decided to use the Cherokee’s built-in navigation. Search results for ’Subway’ showed one nearby and we took the first exit towards it. In our rush to quickly find a place to eat (and not waste time) we only looked at the distances. As it turned out, we actually went back south on an internal road! The stop was a quick one. On our way in, we met a woman who asked us which part of India we were from. She informed us that she had lived in Chennai for six months or so; probably as part of a Christian mission, from the way she mentioned a few things. While eating, Saurabh called up the ski resort to inform them of a possible delay in our arrival. Leaving Provo, we started on the Provo Canyon Road that would take us through the mountains. The drive was superb. While traveling south from SLC to Moab, we had taken a different, more direct route. As the mountains around us opened up, we were greeted by a beautiful view of the Deer Creek Reservoir. In a few miles, we could see Deer Creek State Park to our left. The scenic drive along the lake lasted for the next seven miles or so. No pictures clicked from the moving Jeep did justice to the beauty of the lake. In a few miles, we started climbing. It wasn’t a typical mountain road climb but a gradual one with hardly any hairpin turns. We were on a plateau of sorts, waiting to get closer to the mountain. On our right we saw the Jordanelle Reservoir. We continued to climb. But it didn’t feel like climbing. 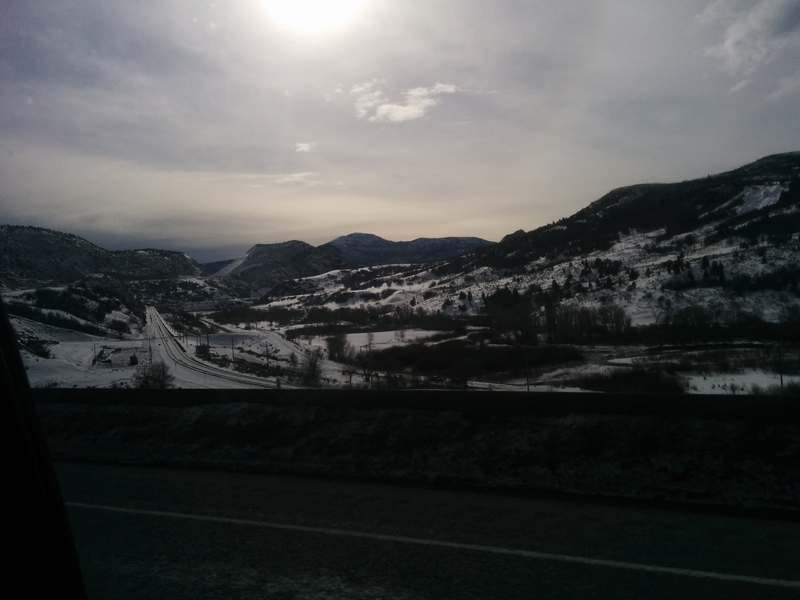 As we got closer to Park City, the plateau ended and we started on the slope of a mountain. It’s worth mentioning that even the mountain road had three lanes on each side! I have never been to Switzerland. But based on what I’ve read and seen on TV, it must certainly have places like Park City. Small, crowded, but pretty roads. Slope-y streets, with cozy shops, cafés and restaurants. Houses with sloping roofs with the mountains in the backdrop. I’ve seen a few places around the US in the last two and a half years or so but for the first time I felt I was in a different, European country. Of course, we didn’t have time to enjoy all that right away as we were forty-five minutes behind schedule already. We reached the skiing resort at quarter to one. Our training was scheduled from one till four. As we entered the parking lot of the resort, there were ‘Parking Full’ signboards everywhere. Saurabh and Madhavi got down at the entrance and went ahead to speak with the instructor. Vikram and I circled the large parking lot in vain, three times at least. There was a lot of activity in that lot. Open cars and SUVs; people carrying rented gear; unpacking their skis, boots, jackets, head gear, eye gear and snowboards; children walking across the road in their tiny ski boots, holding their parent’s hand. A traffic guard advised us to go down the slope a couple of blocks, where there was a public parking lot. A bus would get us to the resort in no time, he added. But somehow we weren’t quite convinced. In a lane adjacent to the resort, we found a street parking spot. In the meantime, Madhavi called to let us know that we should come quickly, as the instructor was getting irritated with the delay. There were even talks of postponing the skiing session to the next morning; an impossible task in the middle of the holiday season, we quickly found out. Grabbing our sacks and jackets from the boot, we made our way to the resort. Our trainer was a tall, well-built guy who always seemed to have a smile on his face. He wore a bright red sports suit (trainer’s uniform, we realized later) and bright blue ski boots. After introductions, he quickly marched us off to the equipment rental section. We filled out applications on the registration computers and proceeded to get our boots. Losing balance frequently: I was prepared for it; falling on my back or face: expected; kids laughing at my ski skills: no problem. But I wasn’t ready for ski boots! Those were the most uncomfortable pair of boots I’ve worn in my life. They were tight, as they should be. Also, it didn’t help that we were supposed to tuck our snow pants, in my case: jeans, into the boots. Putting the boots on was one thing, walking with them on was even worse. Having your ankle locked for the first time makes you feel like a one year old taking their first steps. Nevertheless, all of us managed to start walking and proceeded to get our skis and poles. Then there was the eyewear issue. With a great sense of timing, my sunglasses had broken a few weeks before the trip. Replacing them wasn’t an easy task due to the delay in getting new prescription lenses made. For some reason I thought a ski resort might do eyewear rental as well; a thought that was quickly shot down by the instructor with ‘possible eye infections’ as an explanation. So my options were to ski without eyewear or spend sixty dollars on something I would hardly use again after a few hours. I asked the instructor if eyewear was really, really essential for skiing. He looked at me thoughtfully for a few seconds with his green eyes and said ‘You might do fine for a couple of hours; you’ve got dark eyes’. My perplexed expression prompted him to add ‘it’s just that the bright reflection from the snow can burn your retinas if you have light-colored eyes.’ Great! A fun thought to have during my first ski lesson. Anyways, I returned empty handed to join the others. It turned out all of us were skiing without eyewear! Carrying our equipment, we headed out of the rental area. Just when I thought I was getting used to the boots, we found ourselves at the bottom of a long staircase. At one point it got so bad, I had to climb the stairs sideways, which wasn’t a significant improvement. Reaching the top, we waded through the crowd and finally got onto the snow. The winter sun was about to slip behind the mountain, casting a long shadow on the slope. There was hardly any glare. So much for retina burning. ‘Put your equipment down and get into this position’ said our instructor as we reached the edge of the slope. We were on the opposite side of the entrance to the snow. It was a slope with an ‘easy’ difficulty level, not the small, confined area where kids learn to ski. Our instructor was skiing without any poles, hands behind his back. We were also informed of the ‘pizza slice’ (wedge) position used to stop while skiing. The instructor made us practice getting into the position without skis; it was going to be more difficult with the skis on. We were also told how to hold a ski pole and why its cord loop has to be wrapped around our hand. ‘If you just put your thumb in it, it’s going to get ripped of if the pole gets caught in someone’s skis.’ Fascinating! A short while later, we managed to put on the right ski and were told to walk around: taking a step with the left foot and sliding with the right. Before putting on the second ski, we were told to make sure we were standing perpendicular to the slope. The first thing I realized was how heavy the skis were! Of course, they have to match the height and more importantly, the weight of the person wearing them. So let’s not follow that train of thought. 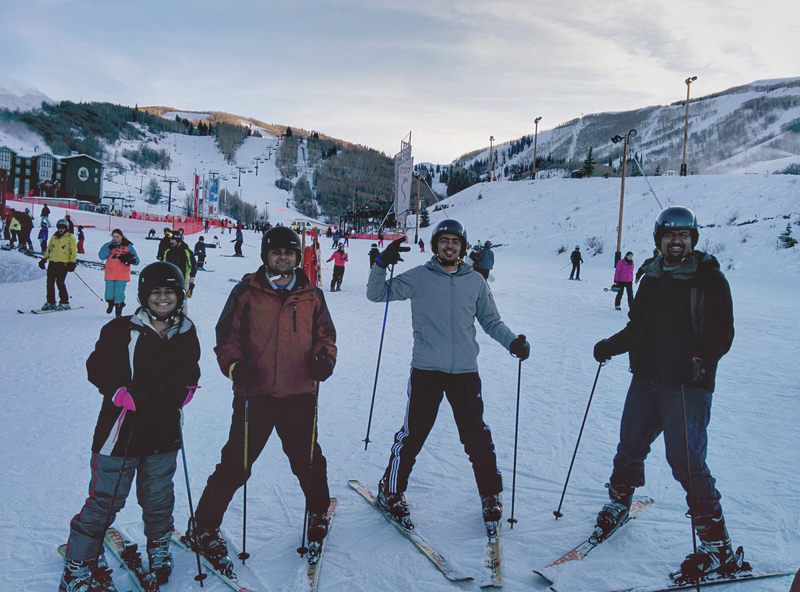 Since Saurabh had skied before, he spoke with the instructor briefly and started going down the slope gradually. The instructor proceeded to help Vikram. Madhavi and I were standing by. Madhavi’s discomfort due to the boots was growing by the minute. I don’t know if she was scared or not but she looked terribly uncomfortable. As Vikram got going, the instructor turned towards me. He asked me to be in the wedge position and moved a few feet away. I was told to gradually make my skis parallel to each other. As I did it, I started moving. A bit too fast for my liking. And so I managed to stop. The second time I tried to get into the wedge position, I did it too quickly, and while attempting to counterbalance the abrupt stop, fell backwards. But the snow was soft as a feather mattress. Skiing: 1, Ice Skating: 0. Getting up proved to be quite a challenge. Since I had fallen flat on my back, my legs were on either side, stuck in an awkward position due to locked ankles. The instructor came over and asked me to turn sideways and get my legs together. After that I rolled to an upright position again. And then he said ‘Alright, just grab your knees and stand.’ Well, that wasn’t going to happen. ‘Come on, the skis move your centre of gravity and so you can easily do it while wearing ‘em.’ And it worked! Looking at our overall (slow) progress, the instructor asked Vikram and myself to go over to the smaller, training slope. We managed to get to the other side of the slope at a slow and steady speed. As we were crossing, kids as young as five were swishing by us; effortlessly, casually dodging two clumsy, grown-up beginners. By this point Saurabh was already on the ski lift, wanting to conquer the easy slope at least. Madhavi was looking more and more uneasy as the instructor was speaking with her. The training slope was fun. Gradual, wide and it had conveyer belts to bring us back to the top. A couple of iterations later, I was able to move and stop without falling! The instructor then came over and asked me to follow him down the slope. He was facing me. As I began to move, he started turning into a snake-like ’S’ pattern. I was quite excited to reach the end of the slope without falling. He asked me to continue practicing turns. Vikram was doing the same. Saurabh had also joined us. And then it was over. Before saying goodbye, we managed to get our picture taken with the instructor. Tired and hurting from the ski boots, we made our way back to the resort to return the equipment. Oh the joy of wearing plain, simple, flat snow shoes again; it felt like I had switched to flip-flops! We headed to cozy coffee shop in the resort and miraculously managed to find a ‘sofa spot’ in the crowded café. The atmosphere was wonderful. Christmas decorations were all over the place. Families, friends, couples, small and large groups were immersed in the joy of the holiday season. We were booked in at The Yarrow Resort Hotel & Conference Center. Everyone was exhausted by the time we checked-in. But this was going to be our only evening in Park City and so we freshened up and headed out again. Parking the Cherokee in a tight street spot one block away, we started walking towards Main Street. The narrow street was packed with people: walking, window shopping, waiting to be seated at restaurants and just hanging out; sporting a myriad of winter jackets and boots. Many shops had an antique-y feel about them. Most of the establishments had holiday decorations. The slight slope of the street added to the beauty of the lights. Even though we were tired and hurting from the skiing session, we walked up and down quite a lot on the street. We saw a restaurant by the name of Bangkok Thai on Main and spontaneously (!) decided to have dinner there. Through its pavement-level windows, we could see most of the tables, and mouth-watering dishes, below. The entrance led to a downward staircase. A polite gentleman in the foyer informed us about a twenty minute waiting time. We agreed, reserved a spot in the line, and went out on the street for more exploration; of souvenirs, in the nearby gift shop. Dinner started with our server asking us if we would like some wine. He insisted, as they had a collection of more than two thousand! The wine menu was a thick one; Tyrion Lannister would have been proud! After hopelessly looking through the menu, the only thing we agreed upon was that paying two thousand dollars for a bottle of wine was crazy. And so we asked the server to get us an ‘affordable red wine, not too sweet’. The food was delicious. One portion each of curry, noodles and rice sufficed for the four of us. An hour and a half later, we headed back to the hotel. In spite of being tired, full and sleepy, we managed to play a few rounds of Uno (with ‘7-0’ rules) before falling asleep. The final day. One of the things on the agenda for the day was ‘waking up late’. After four days of not getting sleep, everyone took it a little easy this morning. 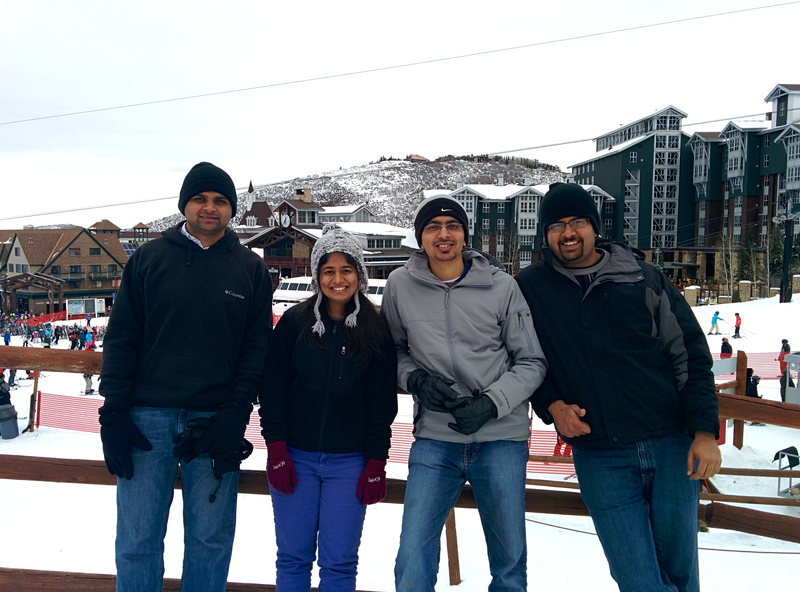 The aftereffects of skiing for the first (second for Saurabh) time were quite apparent. At around 9:30, we walked to an Einstein Bros bagel shop nearby. A spinach-and-egg everything bagel, along with black vanilla coffee made for a great (but light) breakfast. On our way walk back, we explored a few blocks behind the hotel. A better agenda item for the day was the Alpine Coaster. 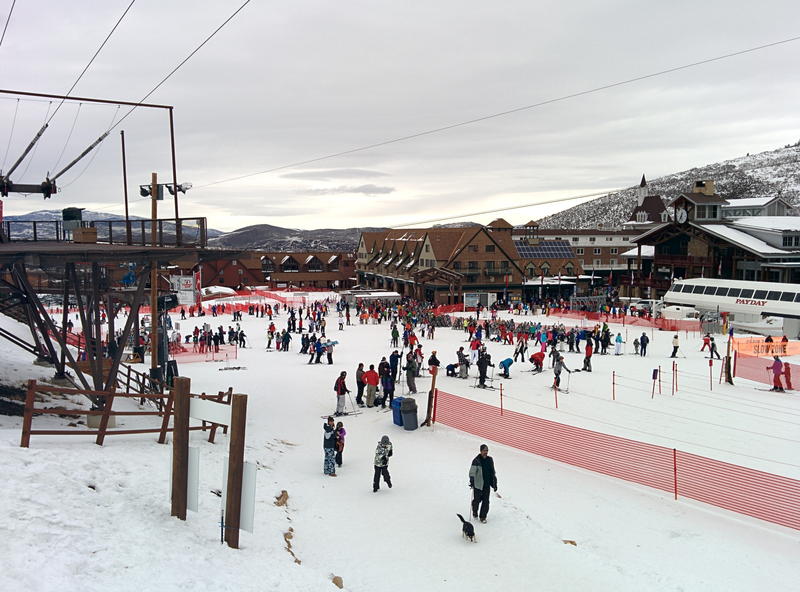 Back at the Park City Mountain ski resort, we stood in line to buy the rather expensive tickets ($20 a pop). But having watched a point-of-view video of the ride, even $50 wouldn’t have stopped us. The sky was heavy and overcast; the diffused light making the snow-covered mountains shine. If we were on a hike in these conditions, a ridiculous number of photos would have been clicked. We walked across the beginner slope (in regular snow boots for a change!) to the far side of the resort to get to the coaster. Park City Mountain Resort. Crossing the slope was quite an intense activity! The Alpine Coaster is a pretty unique ride. Tracks are laid on the slopes of the Wasatch mountain, weaving through trees and snow. The ‘sleds’ glide on the steel rails and have a controllable braking mechanism to reduce speed. A chain system pulls the sled up the slope. The ride up is quite slow and allows you to enjoy the beautiful scenery in peace. Unless you are constantly worried about speeding back down the mountain in a few minutes. Words cannot describe the experience of riding a roller coaster (neither can a YouTube video actually) but please check out the video below. The conditions in the video (snow, sky) are almost identical. Skip to 8:45 in the video if you want to jump to the downhill part. Near the alpine coaster, after the exhilarating experience! While walking back across the ski slope, we were tempted to ski again. The discussion got to a point where we stopped for a moment, ready to turn back, but decided to head back to Salt Lake City. We had quite some time to spare in SLC, before taking part in any New Year celebrations. 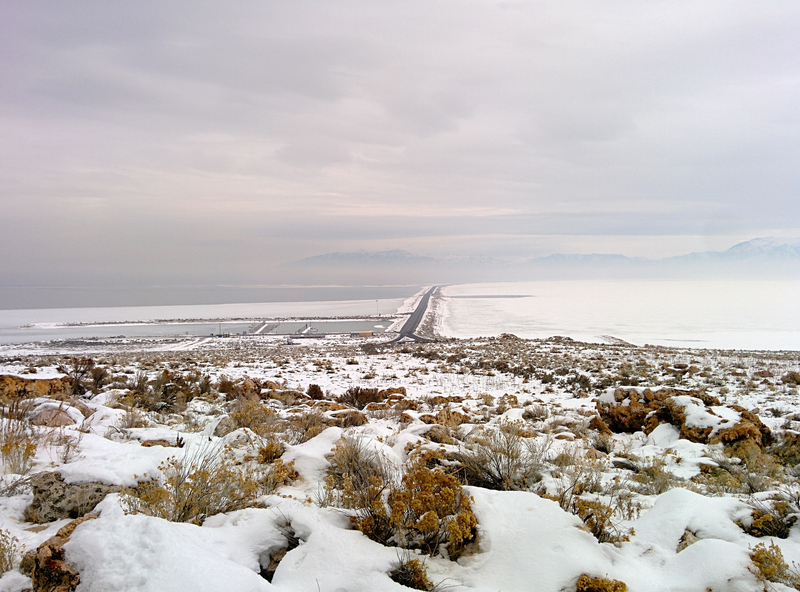 As usual, Saurabh – the ‘local’ boy – suggested visiting Antelope Island, close to SLC. He was a bit skeptical due to the overcast sky but since we had nothing better to do, we went ahead with the two-hour drive. Salt Lake City gets its name from the Great Salt Lake that lies on its northwestern side. Antelope Island is a large island in the Great Salt Lake. The causeway to the island was as straight as an arrow for a long time. We stopped near a small booth to pay the entrance fee. The ambience outside was surreal. The road was a striking black line in a sea of white all around us. We were practically inside the overcast weather! Visibility was quite poor; we couldn’t see the lake at all. A marshy smell and vague dark plains were the only indications that there was water on either side of the road. As we got onto the island, the fog started thinning and we got our first glimpse of the landscape around us. It was quite a mixture: swampy, icy patches covered with snow; snow-capped hills in the distance; flat plains stretching out far into the fog; patches of short, dull-green and brown shrubs and grass covered with snow. But the most striking (and slightly unsettling) thing was the lack of movement. Apart from a couple of cars passing us in the opposite direction we saw nothing else. You’d think a place called Antelope Island would be full of antelopes, right? Or at least you would expect to see a few here and there. ‘That’s an antelope over there!’ one of us said as the Jeep pulled into the parking lot of the visitors center. We could see a dark silhouette of the majestic animal a few feet away from the lot. But every step we took towards it made us realize that it was a (well done) sculpture. Slightly disappointed, we clicked a few photos (how many times did you spot Vikram in the panorama above?) and went inside for information. The island is a twenty-eight thousand acre mass of land within the Great Salt Lake. Rocks as old as 1.7 billion years have been found here. But the most interesting part was finding out that the animal with the greatest population on Antelope Island is … the Bison. Yeah. Saurabh mentioned that there was an interesting place on the southern part of the island. A ranch. Not quite convinced that a ranch would be interesting, we headed south along the Antelope Island road; sticking close to the eastern edge of the island. The Fielding Garr ranch has the oldest house in Utah. It was established in 1848. The reason this place is so special is because many of the artifacts and buildings on the ranch are still there. When we walked into a large shed, it was like walking into a period movie set. Apart from a couple of other people, there was no one on the ranch. The ranch caretaker, a septuagenarian with hair as white as the snow around us, chatted with us for ten minutes or so. The scenery around us was amazing. The ranch was so isolated in the vast, snow-covered desert it looked like a location remote place in New Zealand that could be used as location for Middle Earth. 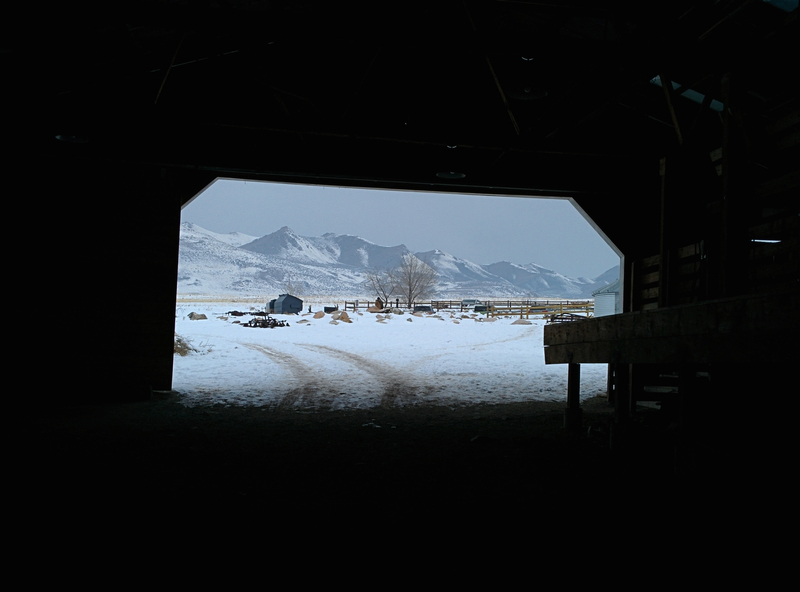 View from inside the ranch. That’s how postcards are framed, I’m sure! It was almost 4:30 PM (and getting dark) by the time we left the island, heading back to Salt Lake City. Madhavi was feeling a little unwell. All of us were tired. The fact that we had missed lunch did not help. We decided to have a late lunch at a place called Taste of India. We devoured the soup, dal and paneer at a ridiculous speed; I don’t even remember the taste! 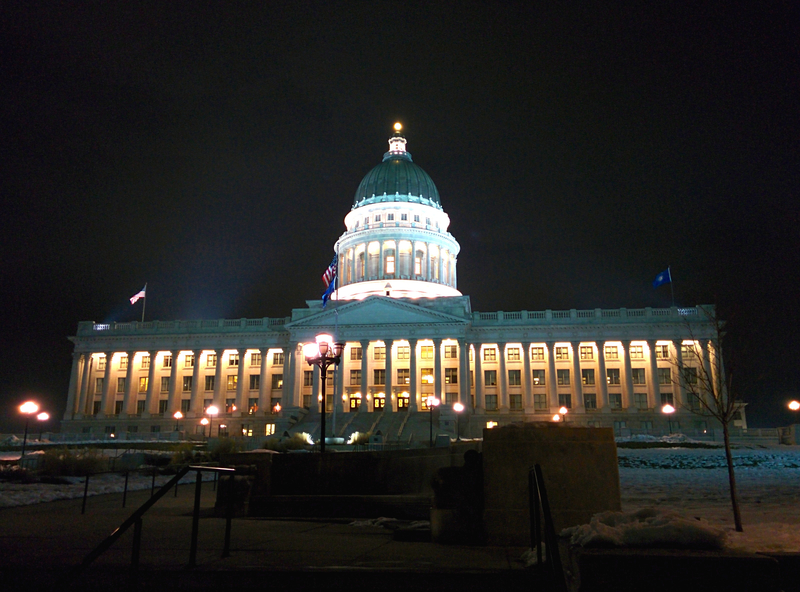 The Utah State Capitol was our next destination. The building had an imposing presence and great architecture. Having visited Washington, DC last year, I had thought that this would be just another government building. But it was great experience. As we walked around it, the path was, at places, flanked by detailed statues. It was also quite icy and I slipped a couple of times but managed to stay on my feet. After that, it was decision time: either check-in at our hotel, or start the New Year celebrations a little early. We went with the later one and went to the historic Temple Square. The place was covered with decorations. Trees were lit up orange in their entirety. Red, green, and yellow lights were seen covering short poles; creating the effect of short christmas trees. 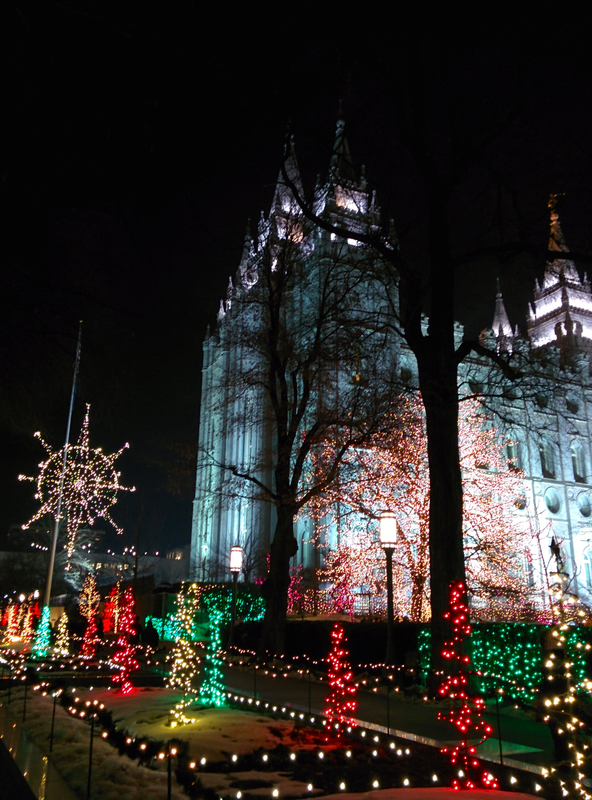 The beautiful Salt Lake Temple was lit up in a pale white light at the base; a pristine white light glowed from the top of the towers at the four corners of the building. Salt Lake Temple. The only picture I could take that did not have a million people getting in the way! We stumbled upon a live performance in Salt Lake Tabernacle next to the temple and decided to go in and watch. The tabernacle had a slightly rotund, oval-shaped structure. The seats in the orchestra section were long wooden benches. The balconies had wooden railings. The highlight of the structure was the massive organ at its end. We managed to find seats at the back, just in time for the organ performance. Next up were Irish step-dancers. After that, a soprano prodigy stunned us with her performance. It was the first time I had seen a live soprano and I am sure it wasn’t my last! Since the tabernacle was built before the era of microphones, it was designed to have good acoustics. 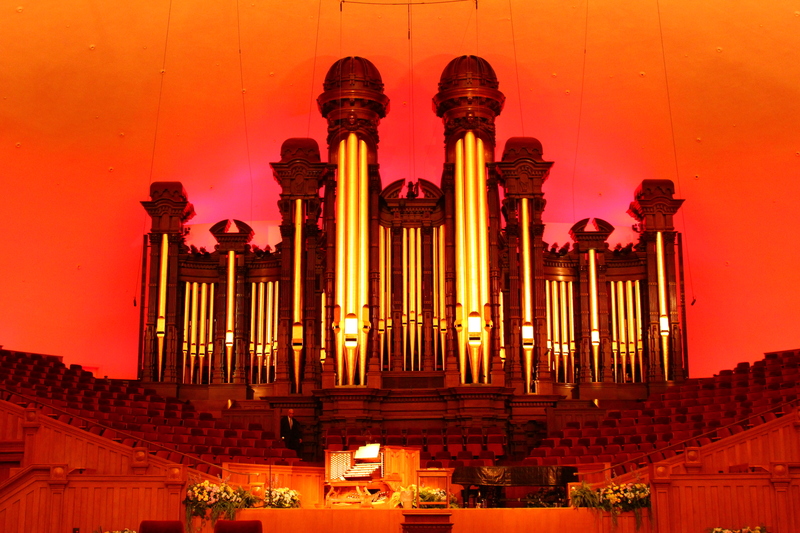 The Salt Lake Tabernacle Organ. Photo by Saurabh. By the time it was 8:00, we were feeling exhausted. We figured that staying here for another hour of so would mean missing the New Years’ celebration. We checked-in at out hotel by 9:00. Everyone was stretching out. Since there would be no more snow-trails to walk upon, we could finally ditch the heavy snow boots. At 11:00, it took quite a lot of will power to convince ourselves to get up, put on the heavy jackets and head out into the cold again. As 2014 showed up, a bunch of firecrackers exploded above us. And they just didn’t stop. All sorts of colors and patterns appeared above our heads in varying intervals. Every once in a while a single, massive firecracker would explode, prompting the crowd to cheer loudly. It was a wonderful place to be at. Sadly, none of us clicked any pictures. The fireworks lasted for fifteen minutes or so. A great, climactic way to end an epic trip. Everyone was sleeping on the morning flight back to San Diego. The moment we got out of the terminal, it was a different world. A world without snow, majestic mountains, canyons, lakes, a lot of things. The Southern California sun was shining brightly in the clear sky and yet it could not melt the gloomy atmosphere in the airport shuttle as we headed home. Utah is an amazing place! It certainly won our hearts. And because there are so many great places still unexplored there, we’re definitely going back some day. Thank you so much for reading my first travelogue! 🙂 I am hoping to travel more and keep writing more of these. Kindly leave your thoughts in the comments section. Link to Part 1 and Part 2. If you have read the first part, thank you very much (seriously, you people are the best!) and please carry on. If you haven’t, here you go! I was awake by five. By six, it was breakfast time. Vikram had brought along some instant tea packets: they contained milk powder as well. The two bathrooms ensured everyone was ready by quarter to seven. Sunrise was at 7:35 AM. Google Maps told us that the drive to Mesa Arch, our first destination, would take half an hour at least. By the time we were in the Grand Cherokee and setting the GPS, it was five minutes to seven. But we started the day on a great note: clear sky! The early morning drive was a pleasant one. Although we would have enjoyed it more if we weren’t up against the most relentless, unforgiving and heartless enemy in the world: time. 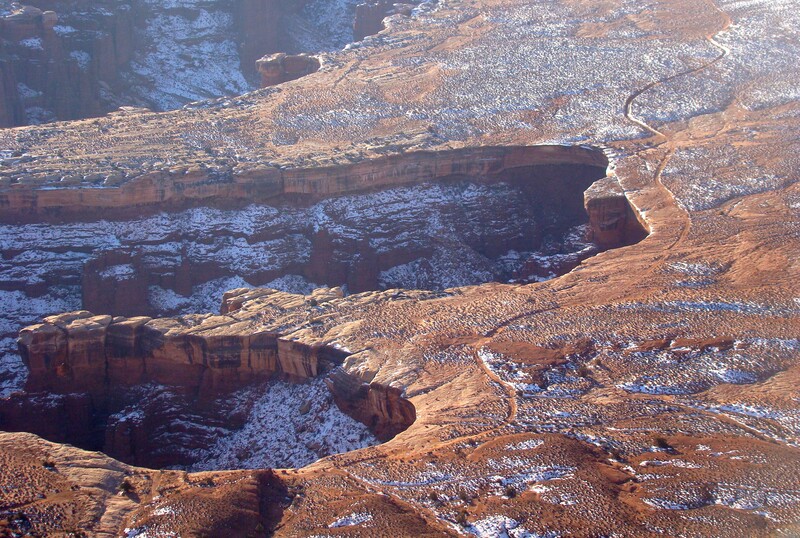 Canyonlands is larger in size compared to Arches. As we entered the park, there were a few sharp turns and then mostly straight roads. 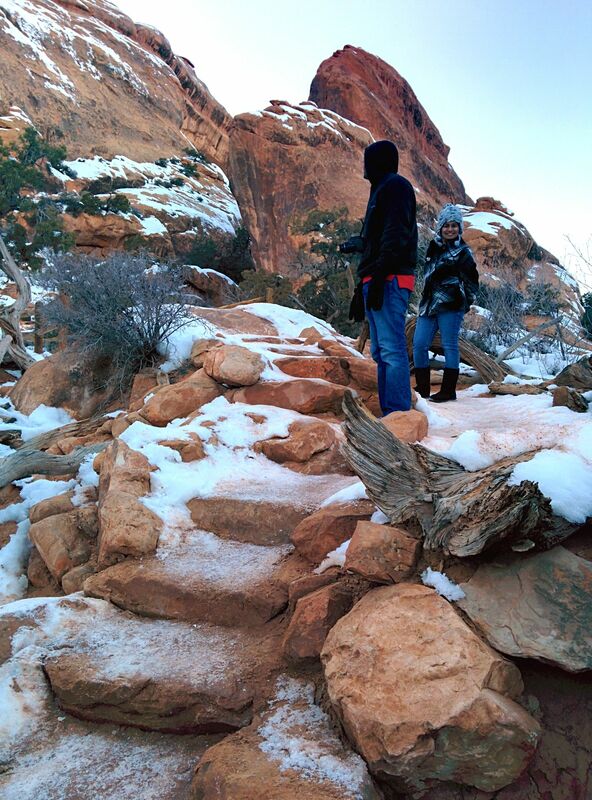 It was quite different compared to the wall-like structure of the rocks at Arches’ entrance. Even in the pristine darkness of dawn, we could appreciate the beauty and the expanse of the park. Our appreciation was, however, constantly interrupted by the burning hopes of reaching Mesa Arch before sunrise. Saurabh was making the SUV fly! 7:25 AM. We slowed down as a toll booth appeared down the road. The moment Saurabh noticed it was empty, he jumped on the pedal again; there was no time to waste! 7:28 AM. A faint glow was visible to our left as we sped through the national park. Some stars were still visible in the sky to our right. The setting was quite poetic. Camping under such a sky would have been a magical experience. Our GPS started reporting distances that didn’t match our expectations. And so Madhavi started navigation on her phone. We were right, Google maps showed a different time estimate. 7:34 AM. We reached the parking area of Mesa arch, got out of the Jeep, and started running down the trail. The blue shade of the sky was getting lighter. Still, we weren’t able to see the arch or the view beyond as we ran down the curvy, partly icy trail, cameras in our hands. The trail finally stopped curving and opened up to an expected, but nevertheless, startling sight. Right in front of the arch, about twenty photographers had mounted their cameras on their tripods. This wall of photographers almost covered our view of the arch from the end of the trail. It took us a few seconds to realize that we had just missed the sunrise. But that did not stop us from enjoying the spectacular view! The photographers were there for a reason. It’s not everyday you get to photograph a landmark that has been featured as a Windows wallpaper! Curving gently, the arch makes a very small angle with the ground. Jutting out from the edges of the cliff, one could think of it as a giant handle for when man needs to literally move mountains. Through the eye-like slit below the arch, the sun was small golden ball, rising above the tall, flat rock to the east. The first rays were touching the inner surface of the arch making the arch glow from underneath in a wonderful golden-red shade. One of the photographers had planted his GoPro camera directly under the arch to capture the sunrise frame by frame. I promptly added it to my to-do list. 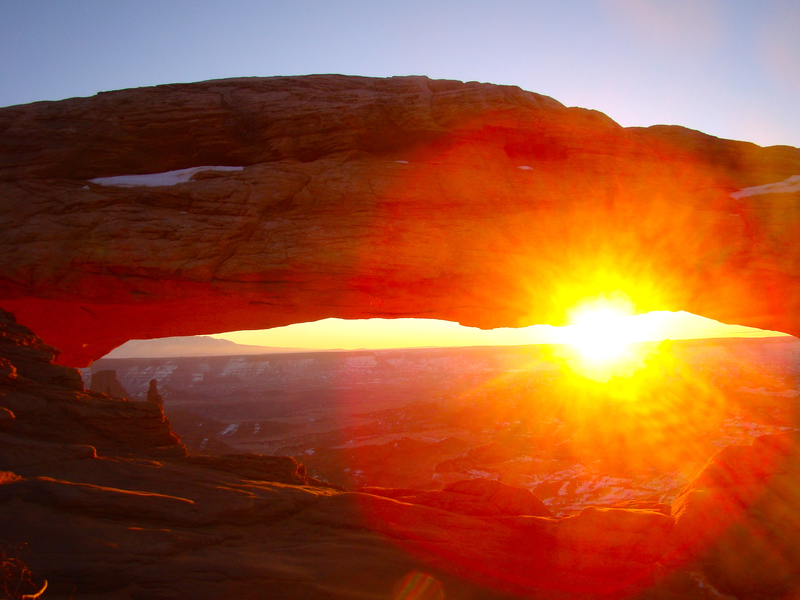 A magnificent sunrise through Mesa Arch! Oh the glow! An excellent shot by Vikram. We took a lot of photos at this point. 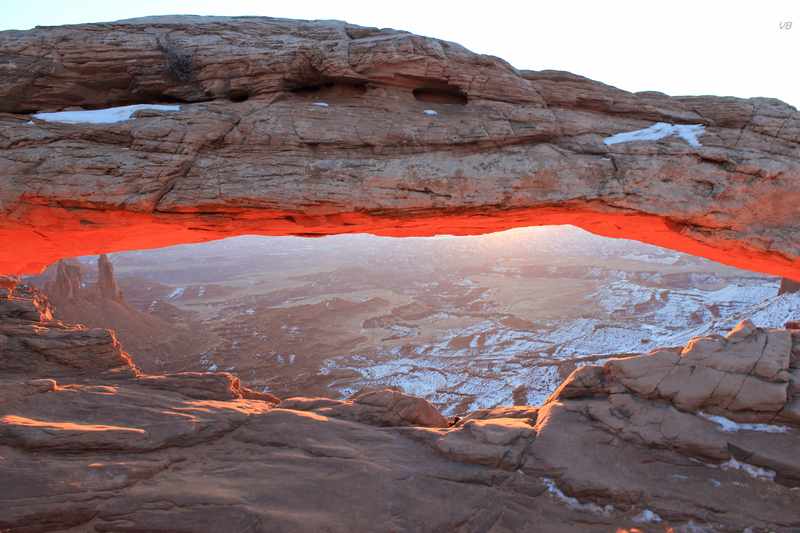 Behind the arch, Canyonlands national park was bathing in the glorious sunlight. Snow was sprinkled unevenly in the valley below the arch. The cliffs on both the sides of the arch had horizontal ‘bands’. I thought they were either erosion markings or the exposed cross-section showing the subtle differences in the layers of rock over time. The first thing I noticed about Canyonlands was that it appeared (it is) much larger than Arches. Color-wise it was the same; although I believe the red rock was slightly lighter in shade compared to Arches. During the planning phase of the trip, almost all the pictures we looked at on the Internet showed great desert views; most of them taken during the summer. Nothing had prepared us for the amazing yet subtle enhancement the snow had made to the barren landscapes. Since my camera is in its twilight years, I was splitting the load fifty-fifty with my Nexus 5. In all the excitement of panorama photography, I had forgotten that the temperature was close to minus fifteen degrees celsius. While in the process of taking a second 180-degree panorama shot, my fingers started hurting. Burning would be more accurate. And so I put on my regular, non-techie gloves that had no support for touch screens and put the phone away. After half an hour or so, the cold was really starting to get to us. And so we walked back up the trail to the parking area. Unlike Arches, we didn’t have much planned for Canyonlands. So after Mesa Arch, it was just roaming around the park and stopping at random spots. The first such spot was ten minutes away from the arch. The sky was blue and clear by the time we got into the parking area near the spot. I was really impressed by the fact that every major tourist spot in both the national parks had proper parking spots, restrooms and water fountains. Of course, one could argue that these things kind of took away the ‘natural’ feel of the park. But there are still plenty of trails and areas that would satisfy such people. The viewing spot was actually the starting point of a long (four or five miles, I think) trail along the edge of the large rock we were on. Tempted by the potentially awesome views, we started down the trail, and turned back quickly realizing the trail was going to take up a lot of time. Since we had specific landmarks to cover in Arches, we couldn’t spend too much time in Canyonlands. And so we stopped at the appropriately-named Grand View Point. An information board enlightened us on the formation of the canyons. Grand View Point. A perfect spot for panorama photography, if the Sun cooperates. Mother nature must have been in a playful mood when the canyons were created. Observing a vast expanse of the park from the viewing point, it appeared as if someone had plunged a huge knife into the earth and carved out the canyons. Their sharp, clean cut edges suggested the same. Far on the eastern side we could see rock structures of dissimilar heights jutting out, giving the impression of a poorly-built wooden fence. This was, I believe, the Needles section of the park. We couldn’t take too many great photographs due to the fact that we were looking east and the sun was already high in the sky. Vikram did make great use of his zoom lens though. Near the edges of some canyons we saw a small, meandering path. Saurabh pointed out it was actually an SUV trail. In fact, we found out that it can easily take a couple of days to cover all the SUV trails in the park. Canyonlands certainly appeared to be the kind of place where you did things instead of just looking around. Madhavi, who had visited Grand Canyon a couple of years ago remarked that this was an equally great place, if not better. Notice the SUV trail near the well-cut canyon edges. We were on the move in a few minutes, making our way to the exit. On the way out, we stopped at the gift shop to buy postcards and souvenirs. The gift shop had a sign near its door that asked visitors to pay the entrance fee inside. And we did, before leaving the park. It was around 9:30 AM when we left Canyonlands. 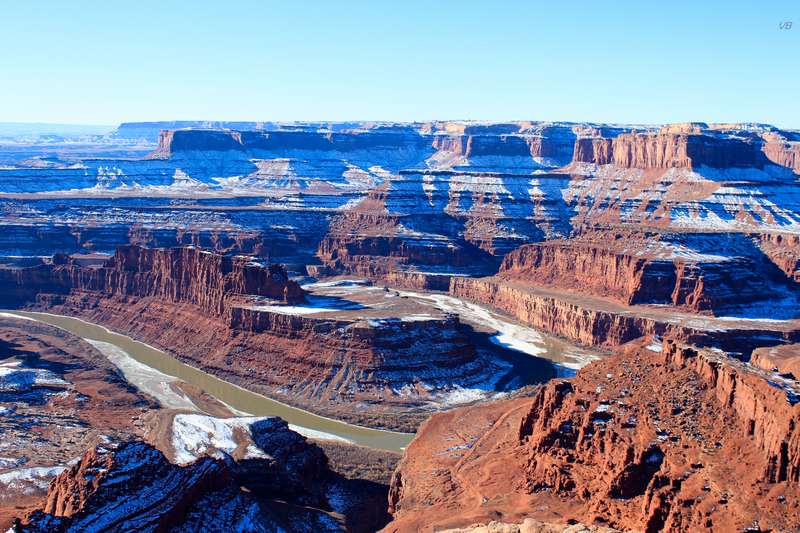 On the way out, Saurabh remembered that there was a state park nearby called Dead Horse Point. Curiosity about the name and the fact that we had some time to spare before lunch, made us head towards the park. The road to the park lies in a North-South direction; branching off from highway 191 towards Moab. To our right, we saw what we thought were oil rig-like structures. We hardly saw other people as we stopped at the visitors center for a moment, before moving on. The main attraction of the park for sightseeing tourists like us was the Dead Horse Point, providing a superb view of the Colorado river and Canyonlands. It was a spectacular sight. The small Canyons, through which the river flowed, formed a maze of curved paths. Snow was sprinkled on top of the red rock. 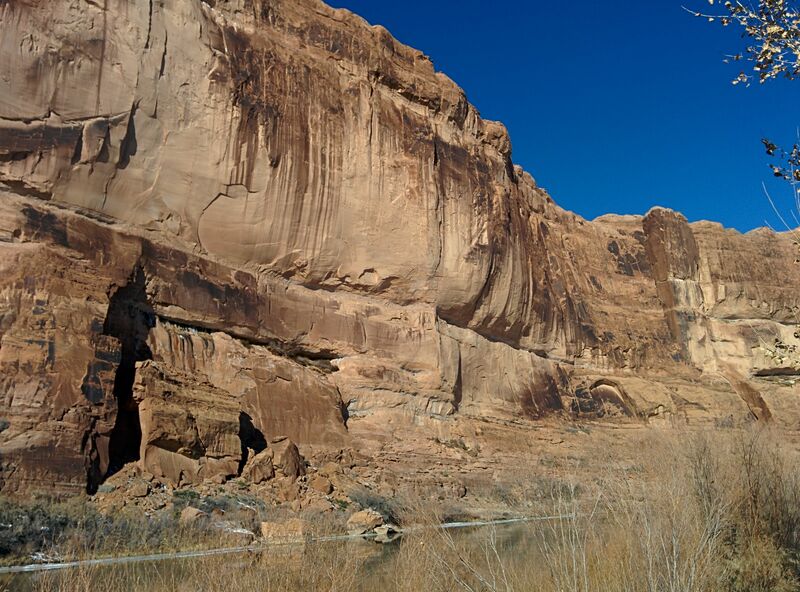 The green Colorado river, snaking its way through the rocks, could be seen shimmering around every few corners. A large plateau-like rock was providing a geometrically straight backdrop. The whole scene looked like an unbelievably realistic set of an Indiana Jones film. I was trying hard to save some of my camera battery for the second half of the day but it was getting harder by the minute. My phone did a great job by not destroying a couple of 180-degree panoramic photos. 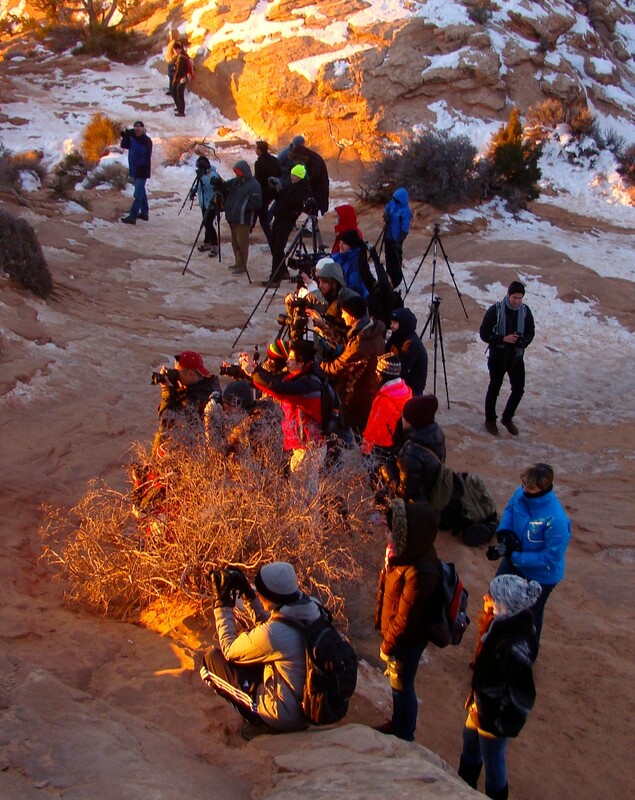 But just like at the Grand Viewing Point in Canyonlands, the sun was directly above the viewing area. None of our portraits with a canyon background were coming out well. After a while we went to the western edge of the viewing area, where there was a wooden observation deck. The western side offered a more detailed view of the Colorado river. I took over Vikram’s DSLR as he wanted a portrait shot with the red-white rock as a backdrop. As I took the third photo and moved forward to show it to him, the unimaginable happened. The camera slipped from my hands. And its strap was not secured around my hand. Memories of that moment are like a slow-motion action sequence. Instinctively, I tried to grab the camera with my right hand and it stuck. Inches above the ground. I am sure Vikram’s heart had stopped beating as well. Nevertheless, we continued taking pictures for some time. The temperature was around minus ten degrees (none of the pictures made you think that, right?). By the time we got back to the car my fingers were hurting so bad I thought they would simply stop working. The Colorado river snaking through the canyons. Photo by Vikram. While on our way back to Moab, we could now see the beautiful sights we had rushed past early in the morning. The sky was a clear blue. I’m not sure if it was the sun or change in composition that made some of the rock structures appear yellow. We hit a patch of road where there was a sheer wall of red rock on our left and a small stream on our right. Saurabh mentioned that the last time he had visited Canyonlands with his college friends, they had camped overnight on the bank. Shortly, we saw a small road branching off towards the stream and followed it. Across the narrow green stream, a wall of yellow rock extended as far as the eye could see on the right and curved away to the far side on the left. Tall yellow shrubs and dried grass lined the edge of the stream. Behind them was sparkling snow, all the way to the parking area. All these colors painted quite a sight. After around ten minutes, we were on our way again. I made an interesting discovery in our Jeep. There was a 120V charging point at the base of the driver’s hand-rest! Immediately, I started charging my camera battery, hoping it would make a difference before we reached Arches. The yellow wall of rock beyond the stream. Our plan was to grab a quick lunch in Moab and reach Arches as soon as possible. All of us agreed that it should be a local breakfast/lunch place that had non-red meat as well as vegetarian options. Of the three possible options shortlisted on Yelp, we decided to go to a small, local place on Main street. The place was extremely crowded and there were at least a couple of other parties waiting to be seated. Within thirty seconds, we were back in the parking lot. The other shortlisted places were a few miles away. After a quick discussion, we finally had lunch at an esteemed, niche establishment called Burger King. Post lunch, we decided to make a quick stop at our condo before heading for Arches: batteries, change of jackets etc. By the time we touched base it was twenty minutes past noon. Inside, Vikram called out and asked us to come to his room. The door to the yard at the back was open, and the sight was amazing! View from the back of the condo. We had no idea we were so close to the mountains! Mother nature had scheduled sunset for 5:06 PM that day. We reached Arches by around 1:20 PM. This time we visited the visitor’s centre and spent some time looking at the interactive displays and info-graphics. It was fascinating to discover that the entire area was under sea millions of years ago. Also, since these delicate sandstone arches have been forming (and falling) only due to erosion, the area has been geologically stable (no earthquakes etc.) for around fifty thousand years. A small kiosk near the entrance provided us with some extremely practical information. It asked us ‘How many hours do you have?’ and as we entered ‘3’, promptly provided the different combinations of attractions we could cover. But that was quite unnecessary; we knew where we were going. One of the most well known landmarks at Arches. Delicate Arch. You know it’s one of the most impressive landmarks when a Google image search for ‘Arches national park’ and see more of its pictures than anything else. This is one of those attractions in the park that you have to put in some effort to see as it is not visible from any of the park roads. That made it even more special. The parking lot was probably the biggest one in the park after the one near the visitors center. From there we started on the three mile hike. Starting on the Delicate Arch hike. The first half of the trail had many gradual slopes. The trail started as a straight, white path through a field of snow, with grass and shrubs all around. As we reached a group of small hills the trail and the surroundings turned yellow. The trail started meandering through the rocky terrain. The Internet had informed us that the elevation change would be around 480 feet. It wasn’t a difficult climb as the slopes were gradual for most of the hike. And wide. I was surprised to see the width of the rock we were climbing; it was like walking up an inclined field. Towards the top, the trail got narrower again and we had to pass through narrow areas, some water logged and muddy. Saurabh, being a Delicate Arch veteran, was periodically reminding us that the arch was still quite some distance away and the trail leading to it would only get more difficult; that wasn’t true of course but apparently it had an impact on us, much to his amusement. The final approach to Delicate Arch is a ledge artificially blasted out of sandstone. This part of the trail was covered in snow and in the shade of the tall rock. We reached a small, icy part of the ledge where people moving in both the directions had lined up. One by one, each side taking turns, we walked over the ice with care. On our left was a sight I had somehow never seen in spite of having experienced a couple of winters in upstate New York: snow grass. 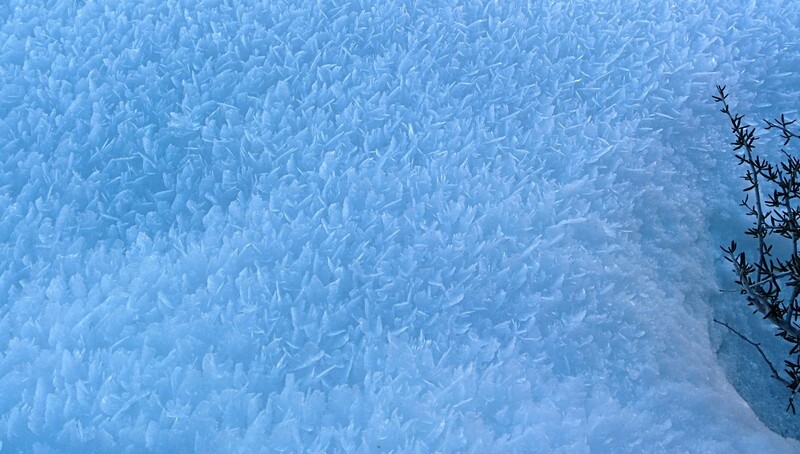 Flakes (or crystals maybe) of ice were tightly packed giving the illusion of a field of grass. I’m sure I would have walked through it had it not been on the edge of a tall rock. On our right, there was a kind of ditch that sloped sharply before joining the rock wall. Being on that ledge was a great experience. Vikram on the ledge leading to Delicate Arch. As we approached the end of the ledge, we could see a sharp bend. 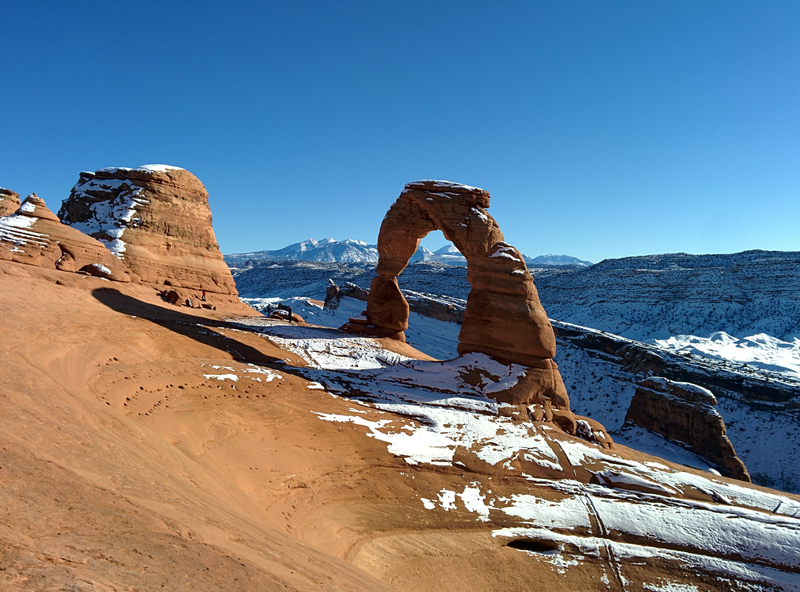 A few more steps, and suddenly there it was: the Delicate Arch in its red and white glory. A truly spectacular sight; a moment I shall certainly remember for a long, long time. The arch was standing at the edge of a wide, sloping and conical rock, making the sight dramatic. It looked like a natural amphitheater. The sky was clear, providing a pristine blue backdrop. Behind the arch and visible through it, were the snow-capped La Sal mountains; the border between Utah and Colorado. Delicate Arch, a wonderful sight. Click on the image for a better view. We sat on a small, rocky outcrop near the end of the ledge, enjoying the sight. To get under the arch, one had to walk along the edge of the sloping rock. Madhavi declined right away. Saurabh quickly went ahead as Vikram and I started taking pictures. Saurabh returned to inform us that the path wasn’t a trivial one, especially near the arch. Still, the three of us went ahead to a spot offering a wider view of the arch. It was as if the arch was deliberately placed that way to make it more rewarding the closer you got to it. We carefully moved along the sloping rock, while watching a middle-aged man in a bright red jacket almost jogging his way to the arch, at an angle much steeper than ours. After getting a couple of group pictures taken, we sat down on the high rock directly behind us; the ‘balcony’ of the amphitheater. The weather was quite pleasant at zero degree Celsius, although there were short gusts of wind that made glove-free photography quite an unpleasant experience. But that wasn’t going to stop us. There was no better spot to finish off my camera batteries. Shortly, we started on the hike back. Since the sky was clear today (as opposed to the day before), the late afternoon sun made the wide, sloping rock glow. We reached the parking lot at four. I don’t remember if we had planned it earlier or not, but next stop was Landscape Arch. Sunset was just an hour away. The entry to the Landscape Arch trail was quite different compared to the other landmarks. We had to walk through a narrow, icy path through a huge rock with steep edges. I looked at Vikram and both of us said the same thing: ‘Paths of the Dead!’, referring to a scene in The Lord of the Rings where Aragorn, Gimli and Legolas disappear into the mountains to recruit an army of dead (and disloyal) men. That sequence was awesome in the book and really well done in the movie too. ‘What say you?’ Anyways, back to Arches. As we walked along the trail, the rocks on either side gave way to a somewhat wide area. There was quite a bit of snow accumulated everywhere. We were in the shadow of the tall rocks guarding the entrance of the trail, giving the rocks a dark (often bloody) shade. I observed that there were quite a few trees and shrubs along the trail; we hadn’t seen many since the last couple of days. A high ‘wall’ of rocks was on our left, blocking the sun. To our right, we had a wide view of Arches, shining in the light of the golden sun. The trail was at a slight elevation, allowing us to look at a wider expanse of the park. Sandstone fins could be seen quite regularly along the right side of the trail. These fins are arches in the making. A hundred thousand years in the future, visitors (hopefully human) will be able to see lots of new arches and a few of the old ones that manage to survive. 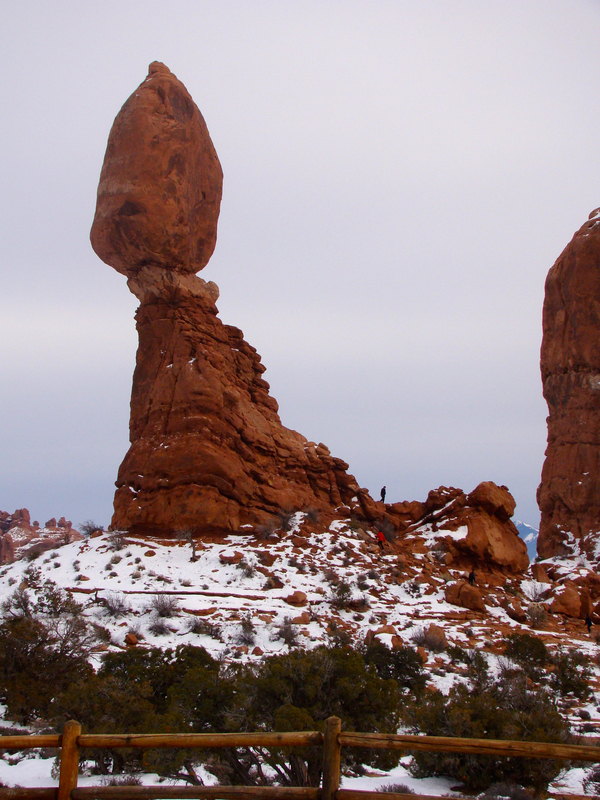 The National Park Service has excellent information on the formation of arches. 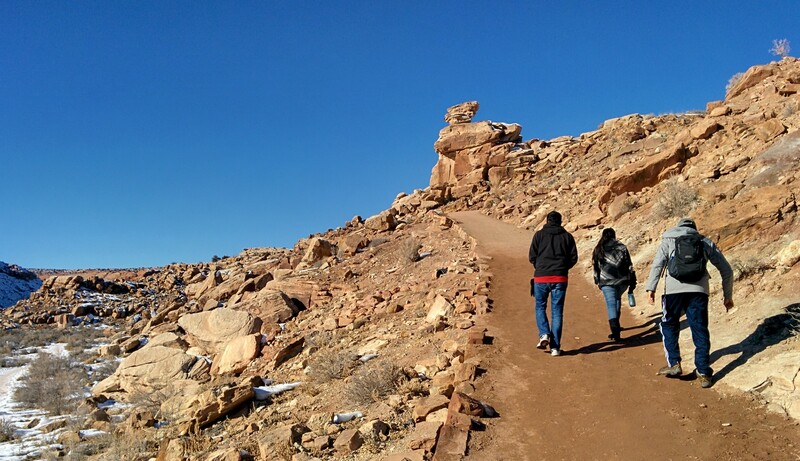 Saurabh and Madhavi on the Landscape Arch trail. 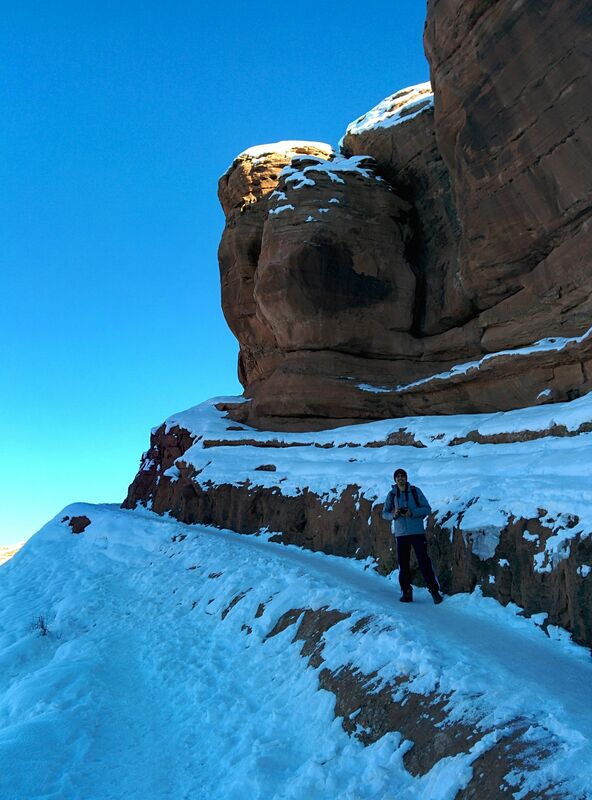 As we got closer to Sandstone Arch, the trail narrowed again. We met a few groups of people heading back. It was getting dark fast. But the arch was worth the walk. Leading up to it side, the trail had fences on either side. We had to climb a few natural ‘steps’ as well. Overall, it was a very pretty sight; it felt like a movie set at times. Not a grand backdrop for an action sequence but a set designed for an outdoor Christmas party. The arch is one of the most delicate popular landmarks in Arches. 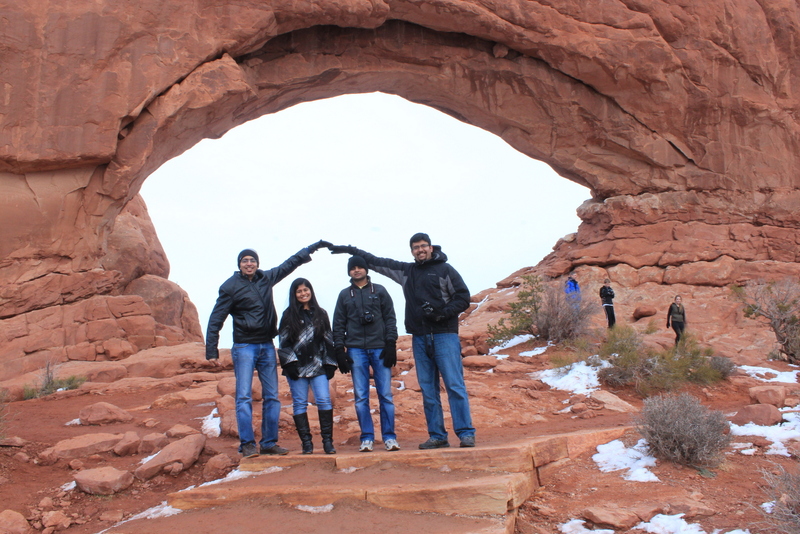 Before we reached, Madhavi mentioned that the arch could fall any day now. It was on a slope to the left of the trail. Through its wide opening, we could see the slope and the rocks behind. Landscape Arch. Daylight was failing fast at this point. On our way back, we saw an ice slide: a perfect slope attached to a tall rock, covered with ice. Had it not been getting too dark, it would have been a great start to slipping and sliding on the trip. Arches looked spectacular at dusk. Just like the day before, we drove back to Moab under the stars. Dinner was a quiet affair at a local Chinese place. Everyone was tired, and so we went to the first place we saw; no arguments. One thing I do remember vividly is that I had eggplant in its whole form for the first time and actually liked it! We retired to our condo before eight that night. Although, we did not sleep for a couple of hours at least. A major topic of discussion was the plan for day four, a day involving Skiing for the first time! Thanks for reading! As always, comments and feedback will be appreciated 🙂 Part 3 is on its way here! On a Tuesday in November, I was at work when Vikram messaged me about a possible Utah trip at the end of the year. Since my ex-roommates from Rochester, NY were coming over for four days and leaving on Christmas, I was not too sure about the trip. But things worked out and we asserted our commitment by purchasing air tickets to Salt Lake City. I had thought of writing a travelogue right after my ten-day Europe trip in June of last year. Somehow it never happened. In September, I had a chance to visit London and Oxford. This time I was surely going to do it! But moving to, and settling down in a new place made me forget about it. So I was determined to write about the upcoming trip. Moreover, my ex-roommate Vikram (not the one who told me about the trip) wrote an amazing travelogue about his experiences in San Diego. That was enough inspiration to begin writing. 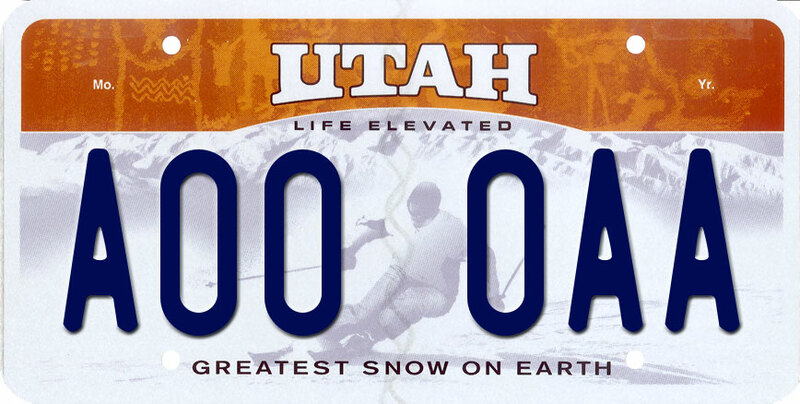 The title-inspiring license plate. Is it really the greatest snow on earth? Could be! The five-day trip resulted in a sizable travelogue and so I thought it would be best to reduce the wall of text in each post by breaking it down into parts. Also, that would allow me to post ‘new’ content in some time and hopefully have Facebook’s News Feed algorithm put it in front of your eyes! 😛 Feedback and comments will be appreciated at a legendary level! You can also let me know if you don’t like this piece of writing and the intensity of your feelings as well – ‘had to punch the screen’, ‘searching for author’s address’ etc. I might not publish the subsequent parts … Nah I’m kidding, I am going to do it anyways! Anyways, here we go. All the pictures (except for the Google-searched image above) are taken by Vikram, Saurabh or myself. Panoramas are clicked by my Nexus 5. “When three out of four people are taking their cameras along, why should I bother?” – Madhavi. As the afternoon heat peaked at two o’clock, I was home from work. The bags were ready by the door. A flurry of phone calls and a quick lunch later, I was waiting for my roommate to swing by. He arrived on time, and after collecting Saurabh on the way, we headed to the airport. 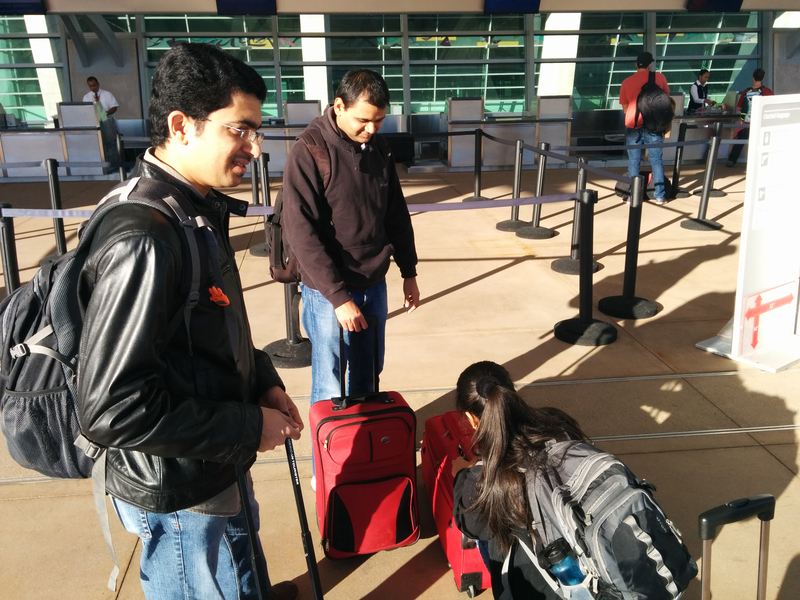 Vikram and Madhavi were coming to the airport in another friend’s car. After saying goodbye to my roommate, Saurabh and I sat on a concrete bench near the departure gate and began chatting. Having met him just a couple of times before, we had quite a lot of things to discuss. Half an hour passed and there was no sign of the rest of our party. As Saurabh was making his third phone call to Madhavi (I had pitched in with a call as well), we saw them arrive. Men’s grooming seemed to be the topic of the moment as both Saurabh and I had last-minute additions to our common check-in bag. My shaving kit and Saurabh’s giant can of shaving cream. Yes, you could certainly shave a gorilla with that amount of shaving cream! Madhavi making the last-minute additions. Multiple winter jackets had forced us to take a big check-in bag along. Regaining our composure after a few fits of laughter, we checked the bag in and went inside the terminal. Post security, we were sort of in the mood for some tea or coffee but only Saurabh was successful in overcoming the potent combination of indecisiveness and laziness, and got himself a bagel. At the gate, I was made to wait as almost everyone else boarded the plane. My seat had been reassigned to accommodate a young couple with a child. The airline official was having trouble printing a new boarding pass. My absence was quickly noticed and I got a call from Vikram; I didn’t answer it as the printer had finally stared singing its monotonous song. The two hour flight was uneventful. An early sunset had turned the sky blood red on the eastward flight. I went through quite a few pages of Jeffrey Archer’s Only Time Will Tell. Although as we neared Salt Lake City, my head started hurting a little. Something to do with the cabin pressure most likely. Even Madhavi felt something wasn’t quite normal about the flight. Skis, snow boards and oversize baggage everywhere! It was 9:40 PM. Grabbing our bags, we waited for a couple of minutes before heading out towards a rather prompt taxi. Stepping outside, I was immediately nostalgic. Chill winds, and vapor coming out of my mouth as I speak, can take me to Rochester, NY (RIT alum; Go Tigers!) from anywhere in the world. Dense fog greeted us as we moved out of the airport area. While it wasn’t snowing at the time, the slightly muddy snow on the sidewalk suggested it had snowed a few days ago. The SpringHill Suits Marriot was located close to SLC downtown. Close by car, of course. Shivering, we entered the hotel, checked into our room and walked out in our winter jackets. There was an Indian restaurant by the name of Copper Bowl nearby, that was selected (after an intense discussion) for dinner. 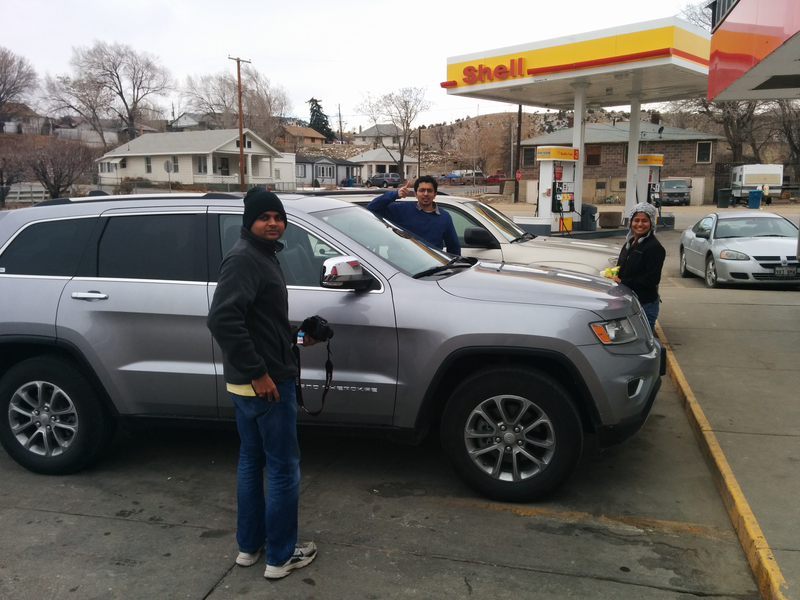 As Saurabh had lived in Utah for two years during his Masters, it was a homecoming of sorts for him. And also the reason we were able to plan the finer details of the trip. Copper Bowl turned out to be a good restaurant save for the overzealous waiter who thought our Indian looks gave them the license to add a copious amount of chili powder to the noodles! Madhavi had tears in her eyes. But not the kind that go with five-star reviews on Yelp. Rising early, we could see the snow outside in the bleak early morning light. 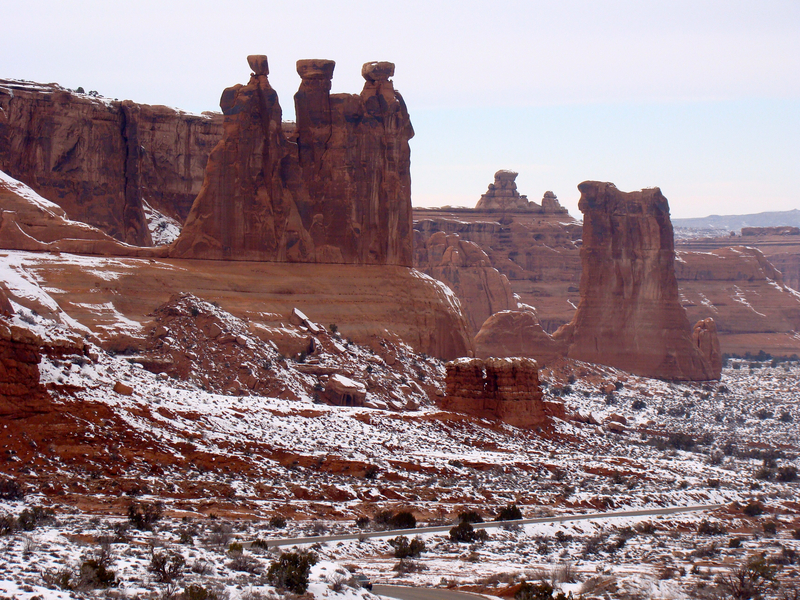 Our objective was to reach Arches National Park as early as possible to make the most of the winter daylight. After getting ready and being dropped off at the Budget rental location, we were in for a not-so-pleasant surprise. The empty parking lot was an ominous sign. Our fears were quickly confirmed when we were told that ‘reserved’ meant ‘you’ll get it today’ and not ‘we’re holding it for you’. Since the holiday season was in full swing, cars returned at the airport were being brought to the location and dispatched promptly. We waited for an hour; the wait punctuated by a quick trip to McDonalds on the other side of the road, for coffee. But the wait turned out to be worth it. We were given a blue Jeep Cherokee SUV. It was the latest model, having all sorts of features. My favorite was the one that prompted the driver to turn on heated seats as soon as they started the car. And the heated steering wheel as well; clearly, we had a great winter car. While signing for it, we were told that only two people could drive the car. As Vikram was renting it and Saurabh was the ‘local boy’, they signed up. As we started making our way out of SLC to get into the mountains, we got a good feel for our surroundings. While the fog made it difficult to get a clear view, we could see the mountains surrounding us on three sides. I’m certain this geographic arrangement is quite unique, especially for a city of this size. We started on the I-15 freeway south. The same I-15 that runs through San Diego! Vikram’s driving and Saurabh’s navigation put us in good shape at the start. Madhavi and I were in the back seat, taking pictures and looking around, while listening to Saurabh’s commentary on the locale. DJ duties kept switching back and forth between Saurabh and myself. Superb views greeted us as we started on the mountain slopes. Snow covered hills, cleared railway lines and huge wind farm fans. For some reason, the Jeep had tinted back windows, making photos darker than the environment. Entering the mountains; near the railway line. The tinted windows resulted in dark pictures from the back seat. Stopping for a quick restroom break at a gas station, we continued the journey through the mountains. After a while, the terrain flattened out and we were on a plateau of sorts. We saw ice capped mountains on the left side and snow fields that stretched for miles on the right. I have seen snow before. Lots, and lots of it. But an arid region covered in snow has its own beauty. Vegetation was sparse. I don’t recall seeing a single bird or animal along the way. The road was quite narrow; passing wasn’t permitted except on dedicated passing lanes, appearing occasionally for each side. Arches lies in the southern part of Utah, which has distinct geographical differences compared to Salt Lake City and the northern region. As we drove southwards, the rocks changed from gray-black to dark green, and then to red. Short, spiny shrubs could be seen mingling with larger green plants. A sheer wall of dark green rocks to our left side was quite a sight. We halted at a gas station again and later at a Subway for lunch. Time was not on our side. The plan for the day was to cover as much of Arches as possible. It would be supplemented by a half-day visit the next day. Again, the sights on our way south were incredible. Bright soil, with shades varying from dark brown to red was covered with shiny white snow, making a truly unique sight. 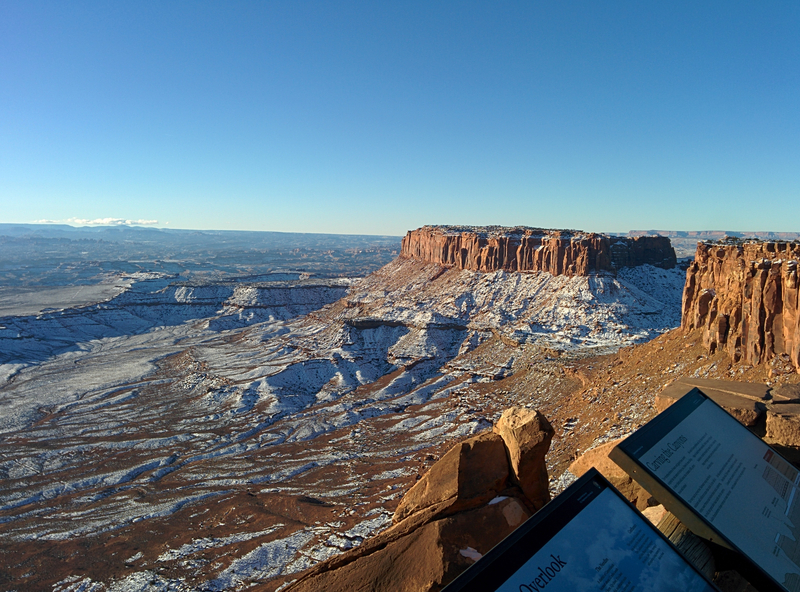 As we were nearing Arches, Saurabh pointed out that Canyonlands National Park was on the right side of the road, a few miles in the south-west direction. Approaching Arches. Notice the different shades of rock on either side of the road. We reached Arches at three in the afternoon. After a quick visit to the visitors centre, we realized we could manage a couple of major sights before sunset, while stopping along the way from time to time. We started on the winding road that leads into arches from the peripheral red hills. It was a cloudy day. The diffused light, always a photographer’s friend, made the red rocks and soil shine in a beautiful hue. While it was not particularly windy, the chill in the air didn’t allow for open windows. The first spot we stopped at was at the end of the winding entrance road. There were no more hills to block the view. We were looking at Arches in its full glory for the first time. Of course, not all of its gems were visible. We were immediately in awe of this wonderful landscape, crafted so eloquently by nature over a timespan that stretched beyond comprehension. The park was a red field studded with white snow spots and green grassy spots; tall rocks and arches abruptly ending the monotony at places. We saw an organ-like structure (which is actually called The Organ, if I remember) about half way across our line of sight. To our left was a tall rock, jutting out of the ground in all its red glory without a speck of snow on it. We took a few pictures. My frozen hands told me that I should either give up on them completely or learn to handle the camera with snow gloves on. As we continued along the park road, we came across The Three Gossips. The sandstone tower had three ‘heads’ at its summit, that were ‘looking’ in the same direction. They appeared to gossip amongst themselves. It was a great sight. We also came upon stubs of great arches that would have existed thousands of years ago. 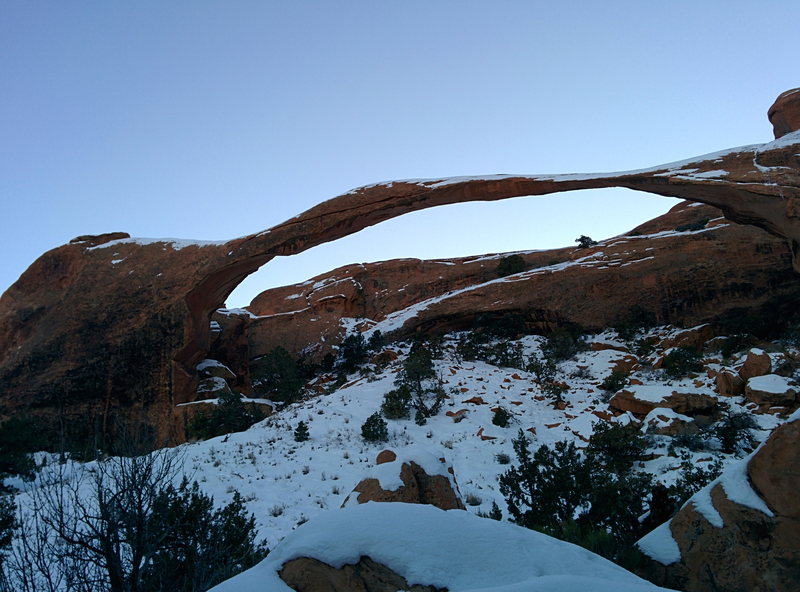 Arches is a geologist’s heaven. Saurabh mentioned that one of his roommates at Utah State was a geology major and could go on and on about almost everything in the national park. I could imagine that. Every type of rock formation and arch we were passing by had its own story, hidden but to those who have dedicated their lives in pursuit of that knowledge. Our next stop was a planned one: Balanced Rock. This magnificent natural wonder was visible for a while, as we approached it. It looked straight out of a Road Runner cartoon; I could visualize Coyote having a rope around it to pull the rock on top of the fastest running bird on television. The forty meter tall, red rock stands vertical on a pedestal-like base rock. A companion rock structure stood behind it. We parked near the trail and walked towards the rock. Pictures were taken. A lot of them. We managed to disturb a photographer, who was deeply engrossed in setting up his telephoto lens on a tripod. He wasn’t too bad with a mobile phone! As we walked around the rock, its appearance changed quite a bit. Becoming more fist-like than an elegant, natural sculpture. Looking south-east, we could see the majestic, snow-capped mountains; providing a gray-white backdrop for the hundreds (if not thousands) of tall, red sandstone rocks. Balanced Rock. With humans nearby for scale. Next: Windows arch. Actually, it is a section of the park that has a lot of large, window-like arches. I believe the name comes from the fact that the view through the arches, like the arches themselves, is quite impressive. While the trail to Balanced Rock was a short one, this time we had to walk uphill. The trail was covered in hardened ice sheets, making everyone walk along its edges. As we got closer, it appeared to take the shape of a giant, empty eye socket. Saurabh and Madhavi reached the arch first. I noticed Vikram’s absence and turned around to find him obliging to a group-photo request by three lovely ladies. He joined us below the arch in a ‘short’ while (the pictures had to be perfect!). The arch was huge! We sat beneath it for some time. It was just an incredible feeling. The wind, over millions of years, had gone from creating a tiny hole in a wall of sandstone to this magnificent structure. A gust of chilly breeze reminded me that the arches were still being shaped. We had seen quite a few cave-like sandstone structures throughout the park. All of them were arches in their embryonic form. After gazing out the ‘window’ for a while, we moved on to another, smaller arch nearby. The bleak daylight was beginning to fail at a rapid rate. And we still had another milestone to hit before dark. An arch before the (window) arch. Double Arch was the next milestone. It is worth mentioning how well-maintained the internal roads, that took us from sight to sight, were. The quarter mile trail to reach this arch was a simple, straight one from the parking lot. The sight is truly magnificent. Two huge arches can be seen connected to each other at one of their base points. From where we were standing, they appeared almost perpendicular to each other, adding to the beauty of the form. The already tall arches were elevated, requiring an explorer to climb to get underneath them. Saurabh and Madhavi started climbing as Vikram and I started taking photos; trying to capture both the arches at the best angles, in the fading light. I was thrilled to take a well-formed, 360-degree panorama picture on my phone that didn’t appear ’stitched’ at any point. Although, it is certainly not the best panorama picture that I clicked on the trip. Check it out below. As the sun finally managed to escape the clouds over our heads and started shining golden on the horizon, we made our way back to the parking lot. We stopped for a while to look at a fascinating view of the park at sunset. If only I had a full-frame DSLR to capture this wonderful scene. The double arch structure can be seen on the right. 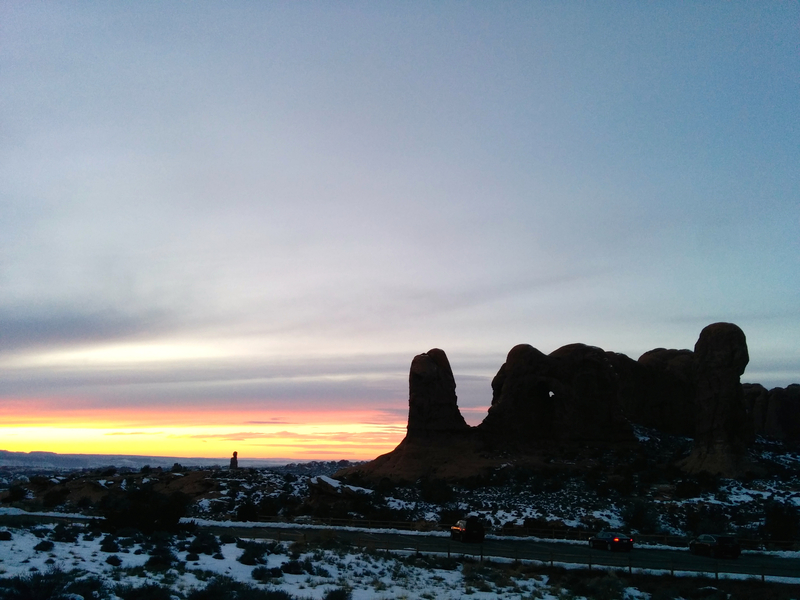 Dusk took over as we started on Arches Scenic drive, back to the park entrance. Saurabh had taken over the driving duty. There was never a better setting to listen to Coldplay’s Fix You. And so we did. Since the night was cloudy, we couldn’t see anything apart from the faint silhouettes of the arches and other rock formations around us. The red park had turned black in a matter of minutes. The drive was a quiet one as everyone was quite tired. Soon, we passed the visitors center headed for the park exit. When Saurabh mentioned this town for the first time in San Diego, I thought, for some weird reason, that it was either an acronym or I wasn’t hearing him right. Nevertheless, this quaint little town was going to be our base for a couple of nights. We were also quite eager to see the condo we had booked. Everyone was famished. The discussion to finalize our dinner destination took us all the way from Arches till our condo, and continued. Moab used to be a mining town. The rich Uranium deposits around it made it prosper in the fifties and sixties. 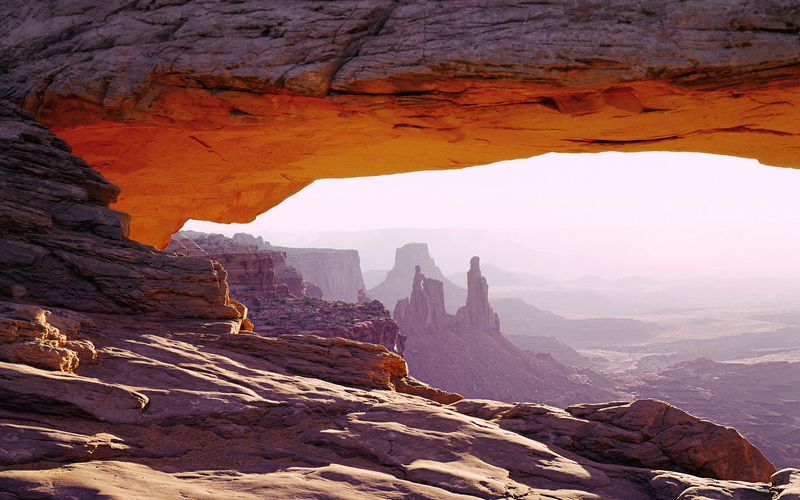 Now, it is a base for tourists like us: visiting Arches and Canyonlands national parks and for other adventure sports enthusiasts, especially mountain bikers and SUV off-roaders. Navigating through its quiet, empty and (often) dark streets, we reached our condo. The street was dark and deserted; there were no street lights nearby. In fact, it was so dark, that unless we were able to get the Jeep’s headlights pointed towards the condos, we couldn’t even read their numbers! Our condo was one amongst a long row of similar ones, which did not help. Finally we were able to locate ours; although Vikram had to get out, walk to it and confirm the number. The temperature that night was minus eight degrees (celsius, of course. Apologies to my American friends). We were pleasantly surprised to see that we had a large garage attached to the condo. What a place it was! Upon entering we saw a cavernous living room with an attached kitchen and dining room. A large TV was on a mantlepiece in front of an L-shaped couch. In a corner, the top shelf of a cupboard contained Monopoly, Scrabble and other board games; books occupied the lower shelf. The dining table had fancy plates, bowls and cutlery laid out on it. The condo contained a master bedroom and two smaller rooms; two bathrooms, quite large; and a separate laundry room near the entrance. But we were hungry and unfortunately, there was no food in the luxury home. Check out the condo here! Seriously, please do. After an hour of discussion, we decided on a pizza place nearby called Pasta Jay’s. The pizza was served on a raised platform and was delicious! Although we couldn’t have been the best critics at that time; we devoured it so fast the greasy cheese barely had time to settle. The pasta and the garlic bread did not disappoint either. An hour later, we were on the Main street in Moab, heading towards Walmart. Why would we do that? For milk and cereals, of course! Stopping for breakfast was typically not an option in our sunrise-centric plans. On our way back to the condo, we saw beautiful holiday decorations along the Main street as well as on some of the houses. Our plan for the next day involved getting up early to catch the sunrise in Canyonlands National Park, and head back to Arches again to see its most well-known landmark. As we were chilling out on the couch, someone pointed out that the next day’s weather forecast was ‘cloudy’. That could be a big blow to our sunrise plans. Multiple weather services were consulted; some of them showed a ‘clear’ day ahead and some of them did not. After a spirited discussion for half an hour, we decided to go ahead with the plan anyways and called it a day. A Great Way To Remember … You! Journal writing is something I’ve always been inclined towards. And I’ve tried to maintain one many times in the last eight years or so – failing, of course. Then I discovered this app called DayOne. Even though it may look like one, it is not just another journal or diary app. DayOne has a feature which prompts you to write an entry after a fixed interval of time. This is really great because otherwise, most of us who try to write a journal, do it at a specific time in the day. But many a times, the ‘I need to write an entry in the journal today’ thought simply doesn’t come or we’re too lazy to execute it. DayOne puts a text prompt (on the Mac) and all you have to do is type a few lines (maybe more) and press save. That’s it! This way, even if you’re in the middle of something, you may actually take out 30 seconds from your busy schedule and type something. I have so many entries in the journal that go something like ‘Working!’ or ‘Grad lab on a Sunday morning. Nothing new.’ Of course, when you do have the time, you’d want to write a detailed post about things happening in your life. The app will also suggest you things you’d want to write about if nothing comes to mind. Once, it prompted me to copy-past an email! It’ll also give you inspirational messages, should you choose to receive them. And the experience is worth it! I started using this app in August 2011. Now when I look back at the entries I’ve written, it feels really weird! Good weird! Obviously, I’m going to remember a lot of things that happened just a year ago but it’s the small details that make it such an amazing read! Things like what made you happy on a particular day or a small joke you shared with a friend … these things will make you nostalgic! I’m sure most of us will find looking back at such detailed ‘snapshots’ of our lives interesting, if not an amazing experience! But there’s a waiting period of course. You can’t start writing a journal and be fascinated by what happened on last Tuesday! Give it time, keep writing and experience something amazing! The developers are amazing and listen to the users’ feedback/requests and incorporate new features into the app. Hope they keep it up! The app is (unfortunately) available for iOS devices and Mac only. And it is a paid app. I don’t know if the developers are making an Android/Windows version but I hope they do! This app is too good to be restricted by platforms.